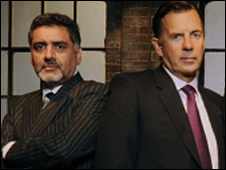 Dragons' Den entrepreneurs James Caan and Duncan Bannatyne have entered a war of words over Caan's UK tax status. Last month Bannatyne said he thought it was "unfair" that, as a non-dom, Caan did not pay tax in the UK on money he earned overseas. In Wednesday's Evening Standard Caan responded: "I do not apologise for my country of origin, Pakistan." Bannatyne retaliated, telling the paper Caan was "playing the race card" and "personalising the whole thing". The spat comes a week before the new series of Dragons' Den is due to be filmed. Bannatyne's original comments came in an article for The Daily Telegraph - which has now been removed from their website. The businessman noted that Caan had recently acquired five health clubs, which he claimed would compete unfairly with his own fitness empire. "As I pay UK tax on all of the earnings that fund my lifestyle, and corporation tax on all of the profits made by my businesses, I am clearly at an unfair disadvantage," he wrote. "It's just as well James and I get on so well, and there couldn't be a nicer man to be in competition with, but you see my point." Caan is a non-dom, and as such pays taxes on his UK earnings but not on any made abroad that are not brought into the UK. He has strongly refuted any suggestion that his chain of health clubs, Nuyuu, is managed by a board of directors outside of the UK. In a statement published in The Evening Standard, the entrepreneur insisted he had no problem with any of his Dragons' Den colleagues, but said there were restrictions on who he would co-operate with. "I'm happy to invest with anyone in the Den. I've got no beef with any Dragon, so long as they have the means to invest on the show with me, and as long as they don't have a criminal record." Some newspapers have interpreted this as a reference to Bannatyne's court martial and dishonourable discharge from the Navy as a teenager. Bannatyne told BBC News he thought Caan's comments were "hypocritical" as he was involved with The Prince's Trust and The Big Issue publication, both of which work with former criminals. He added that at a meeting at the BBC on Monday, Caan had "refused" to shake his hand. Caan did not immediately return a call placed by the BBC News website regarding Bannatyne's comments. In a statement, a BBC spokesperson said: "Dragons' Den is not a team effort. It is all about entrepreneurs pitching to individual Dragons in the hope of winning backing for their ideas, and five hard-headed investors looking for the best deal." Bannatyne, a Labour party donor who has publicly backed Gordon Brown, says his comments have not been made for political ends - but admitted on his Twitter account that he was lobbying for a change to the tax laws regarding non-doms.